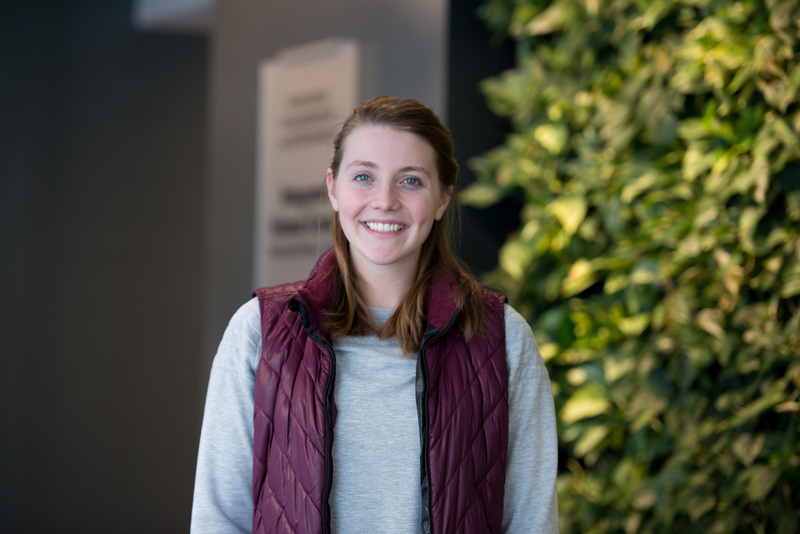 With one successful internship under her belt as a personal trainer at Family Wellness and an upcoming dietetics internship, exercise science major Kendra Stoick ’18 has big plans to help people get healthier and happier as a dietitian and fitness trainer. 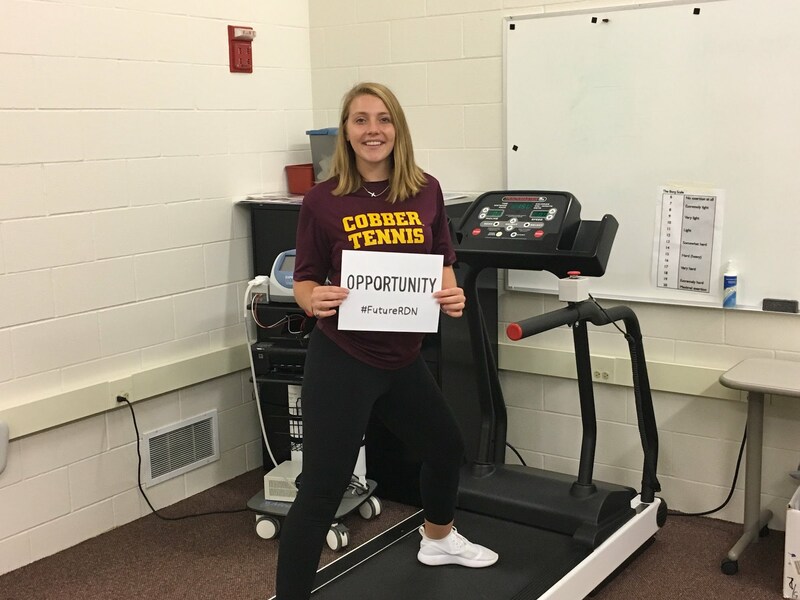 Kenra Stoick '18, Monticello, Minn.
At Concordia, I can be involved in a sport, a music ensemble and clubs while still getting a great education. Everyone here is very friendly and the campus is small enough to develop a connection with your professors and other faculty members. Tennis, Symphonic Band, jazz band, intramural basketball, Fellowship of Christian Athletes, Student Athletic Advisory Committee, Cru, Student Academy of Nutrition and Dietetics, and Exercise Science Club. I also have a personal training internship at Family Wellness in Fargo and have an upcoming dietetic internship. Why did you choose an exercise science major at Concordia? I want to become a registered dietitian and fitness trainer, and all students in the exercise science program have to complete an internship of their choice. This has given me an experience of what my career will be like outside of the classroom. Right now, I have an internship as a personal trainer at Family Wellness, which is my final requirement for my exercise science major. It has given me more confidence in my skills as a personal trainer and has helped me discover what I’m passionate about in my field. What’s one of your favorite things about the exercise science program at Concordia? The exercise science program has provided me with experiences both on and off campus that have prepared me to be a registered dietitian and personal trainer once I graduate. In my classes, I’ve done physical activity assessments and I helped a faculty member develop a workout plan that fit her individual needs. During my internship at Family Wellness, I had the opportunity to develop a group exercise program for adults and I worked with a class of individuals diagnosed with Parkinson’s Disease. I have also taught nutrition and cooking classes to children and the elderly. Since starting the exercise science program at Concordia and getting more hands-on experience, I have more confidence that I have chosen the right career path. What are the faculty in the exercise science program like? The professors make sure that students are learning the information, but they are also very understanding and open to answering any questions that we have. They give us a lot of opportunities and experiences to gain confidence and understanding about our career path. What do you wish more people understood about exercise science? It’s not just about knowing how to do certain workouts. Exercise science is heavily focused on what is going on in the body and how different parts of the body react to different motions and exercises. There are so many myths about exercise and nutrition. One of the biggest myths I see is people who will cut some type of food out of their diet, whether it is carbs, sugar, fat, sodium, etc. As a dietitian and fitness trainer, my goal is to help people develop a healthy lifestyle that is maintainable. That’s the most important thing. There are no good food or bad foods. It is mostly about helping people decide which food they should consume less frequently than others. What is your personal training internship at Family Wellness like? I love my internship at Family Wellness. My clients and the other personal trainers are so friendly. The atmosphere is similar to Concordia’s because both places have a welcoming and family-like environment. My time at Family Wellness has given me confidence in my ability to develop exercise regimens for clients and to connect what I learned at Concordia to my future career. I am excited to become a personal trainer because I love to see the progress that people make and the look on their face when they reach one of their goals. How do you balance being a student, an athlete, a musician and also be involved in clubs? My directors and coaches know that school comes first. The professors are very quick to answer any questions I have, which helps me be efficient and complete my work on time and correctly. What’s it like to play on the Cobber tennis team? We have a tight-knit group. Coach Murrey is a great coach who cares about helping our tennis program improve and makes decisions based on what will benefit our team the most. Playing for Concordia’s tennis team is a great way to continue playing the sport I love while still making my education a priority. What’s one of your favorite memories from your time at Concordia? I love the games and the connections that we make during the van rides to and from my team’s tennis matches. The relationships that I built during these times are important to me, and I know that I will still have these friendships long after I graduate from Concordia. What’s your best advice to incoming Concordia students? Self-care is so important. Many times we try to be involved in too many things and it is easy to become overwhelmed. Focus on what really matters to you, but always leave enough time to take care of yourself, relax and de-stress. What do you have planned after graduation? In April, I’ll find out where my next internship will be. I’ll be heading off to a dietetic internship, which will prepare me to become a registered dietitian and help people improve their quality of life.